Sustainability officials are partnering with local restaurants, including the Starbucks on E and 20th streets, to compost food waste. The partnerships are part of GW's new plan to eliminate waste on campus. Sustainability leaders are shifting some of GW’s green goals by changing expectations of how much waste is produced on and removed from campus. A new sustainability plan released last month, called the “Road Map to Zero Waste,” outlines new initiatives to set the University on its way to diverting 40 percent of its waste by 2020. The plan adds composting and solar compacting goals, which are different than the sustainability program’s original focus on recycling. The Office of Sustainability’s previous goal, which officials set in 2012, was to recycle 50 percent of the University’s waste by 2017. The sustainability plan focuses on waste diversion, which includes recycling, composting and reusing materials. University spokesman Tim Pierce said officials changed the strategy based on current data from the sustainability office, which indicated that the University’s diversion rate in fiscal year 2016 was 35.2 percent. The leaders of the University’s zero-waste institute, Andres Harris and Kris Ferguson, developed the plan with the help of the sustainability office and industry experts, Pierce said. The initiatives outlined in the new plan include redesigning trash can lids and signage to reduce contamination of recyclable materials with trash. GW’s grounds management department will also reduce yard waste in landscaping projects, according to the plan. Meghan Chapple, the director of sustainability, said GW’s recycling rates have increased over the past several years: The University recycled 646,000 pounds during the first quarter of 2016. But she added that GW’s position can pose challenges, as people not affiliated with the University are often on campus. 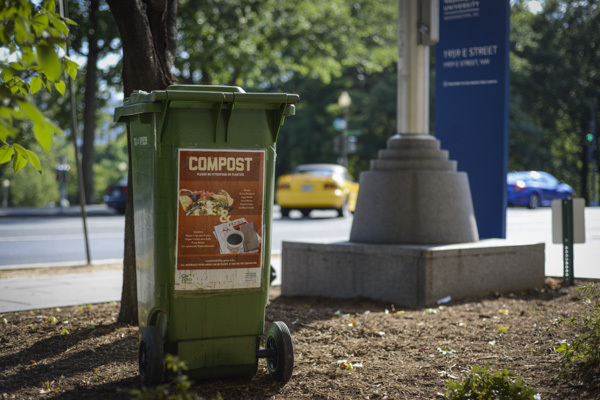 To take advantage of its position as an urban campus, the plan calls for GW to partner with area restaurants to compost food waste. Pierce said Starbucks, Carvings and Tonic have signed on to increase food and coffee diversion, which includes composting and recycling. Subway will also partner to reduce food waste, according to the department’s Twitter account. An outside company, managed by GW, is currently diverting 800 pounds of coffee grounds per week from the two Starbucks locations on campus, Pierce said. Ebony Matthews, a shift manager at the Starbucks on 20th and E streets, said the new composting partnership requires employees to separate waste into different trash cans, depending on the type of waste. Separating waste was difficult at first, but employees have adjusted, Matthews said. Other universities also have partnered with companies to reduce waste. Matthew Buckley, the campus waste and recycling manager at Vanderbilt University, said composting and recycling programs are popular when universities try to decrease their carbon footprints, because it’s easy to mobilize people to change their behavior rather than improve behind-the-scenes functions like water conservation or energy use reduction. “In order to get to those higher levels of diversion, one of the key focus points is waste reduction,” Buckley said. Buckley said that adding outside vendors that may not prioritize using recyclable materials to campus buildings can hinder waste diversion efforts.